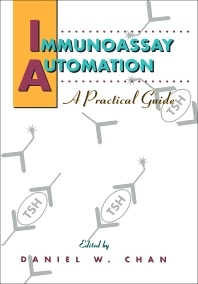 Immunoassay Automation: A Practical Guide describes automation of immunoassay from the practical viewpoint of the clinical laboratory. General introduction and evaluation sections demonstrate principles and practice. A comprehensive selection of available systems are detailed by experts, with a view towards popularity, technical advances, and operational efficiency. This laboratory guide is essential for practitioners in clinical chemistry laboratories, and will have lasting value in the evolution of automated systems. Directors, researchers, students, and technicians in clinical chemistry laboratories, medical technologists; physicians, clinical and basic researchers in university, medical, and industrial settings. Introduction: D.W. Chan, General Introduction. D.W. Chan, Automation of Immunoassay. Evaluation: D.W. Chan, Selection of Automated Immunoassay Systems. D.W. Chan, Technical Evaluation. D.W. Chan, Clinical Evaluation. D.W. Chan, Operational Evaluation. D.W. Chan, Economical Evaluation. Automated Immunoassay Systems: D.W. Chan, Introduction of Automated Systems. D.W. Chan and C. Kelley, Affinity Immunoassay System. D.W. Chan and P.L. Thornton, The AIA-1200 Immunoassay System. J.D. Faix, Amerlite Immunoassay System. B. Goldsmith, COBAS FARA II Analyzer. G. Ellis, CyberFluor Immunoassay System. J.D. Faix, DELFIA (Dissociation-Enhanced Lanthanide Fluoroimmunoassay) Analyzer. W.C. Mahoney, K.E. Opheim, T.M. Fleck, P.A. Schueler, D.L. Enfield, and J.T. Kingsley, Eclipse ICA: An Immunoassay and Clinical Chemistry System. M.A. Sagona, R.H. Gadsden, Sr., and W.E. Collingsworth, ES-300 Immunoassay System. P.P. Chou, IMx System. J. O'Brien, G.G. Klee, and C.L. Shellum, The Magic Lite System and Acridinium Ester-Based Immunoassays. M. Lehrer, L.Miller, and J. Natale, The OPUS System. R. Frye, The Photon-ERA Immunoassay Analyzer. L.M. Demers, The SR1 Immunoassay System. S. Kahn and E. Bermes, Jr., Stratus II Immunoassay System. S.H.Y. Wong, TDX Systems, T. Li, The Vista Immunoassay System. R. H. Ng, Immunoassay Systems for the Physician's Office. Chapter References. Index.